Midsummer seems like a perfect day for a posting on GNU/Linux games! I decided to talk to my family about their favorites. My sons play these things for hours at a time, and spend more hours creating new game levels for them (a favorite activity, which free software games are particularly suited to, since level editors are almost always included). So, it seemed like a pretty natural thing to ask them, as the local expert game testers, what they liked the most. Afterwards, I decided to figure out my own favorites, and my daughter's (she's too little to answer for herself, but it's not hard to figure out what she likes to play with). 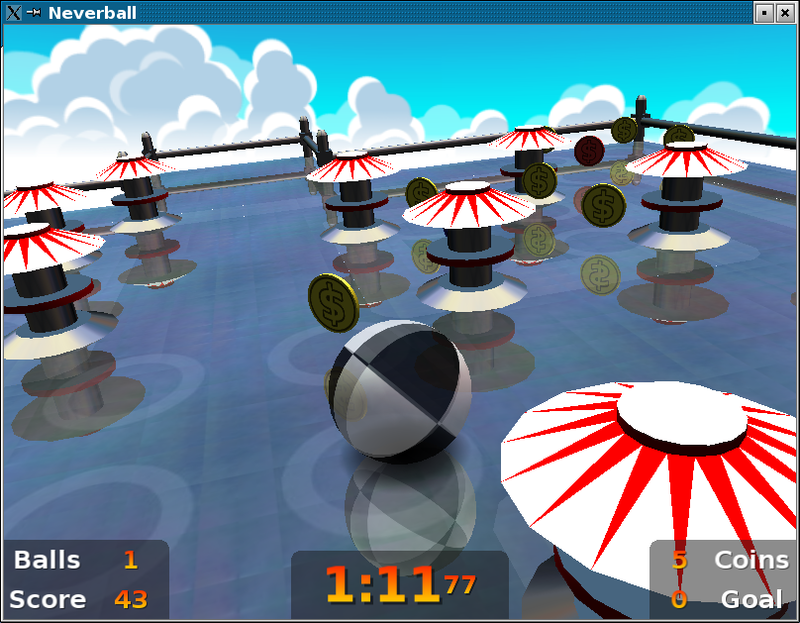 Neverball has excellent 3D OpenGL graphics and beautifully composed sound engineering. First of all, I asked each of my sons to tell me what their "top 5" games would be. Then I asked them to rate each of these games on four criteria: "gameplay", "music", "art", and "editability" on a 0-5 scale (5 being a perfect score). Dashes in the 'music' category are for games with no sound track, some were evaluated on sound-effects only. 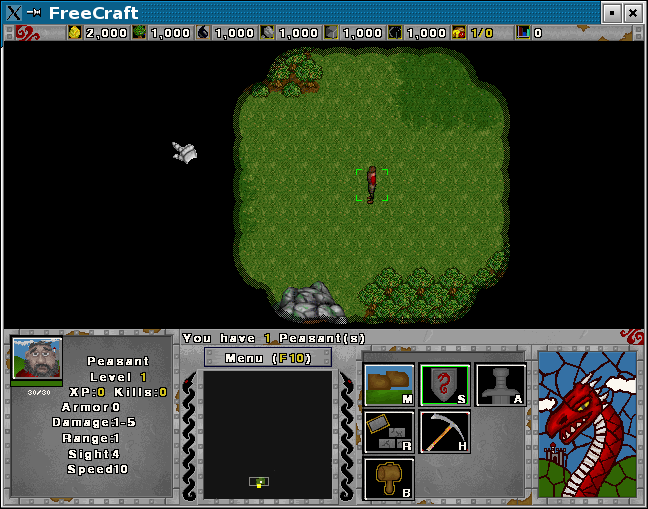 Freecraft is a medieval/fantasy war strategy game. Geki 2: a 'fighter sim' arcade game. 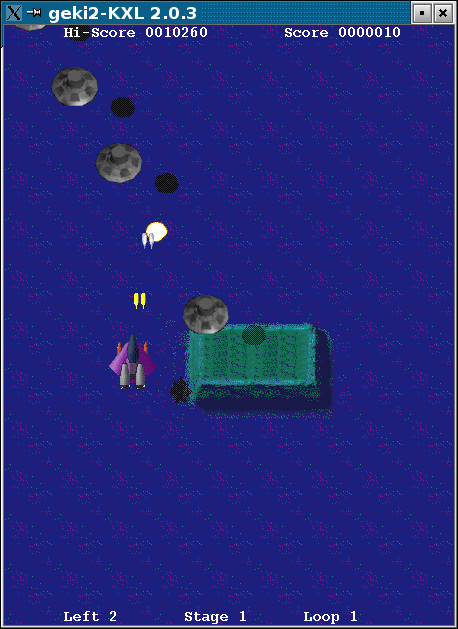 Geki 3: with cool penguin spacecraft styling! PySol has one of the most complete sets of solitaire card games I've seen. 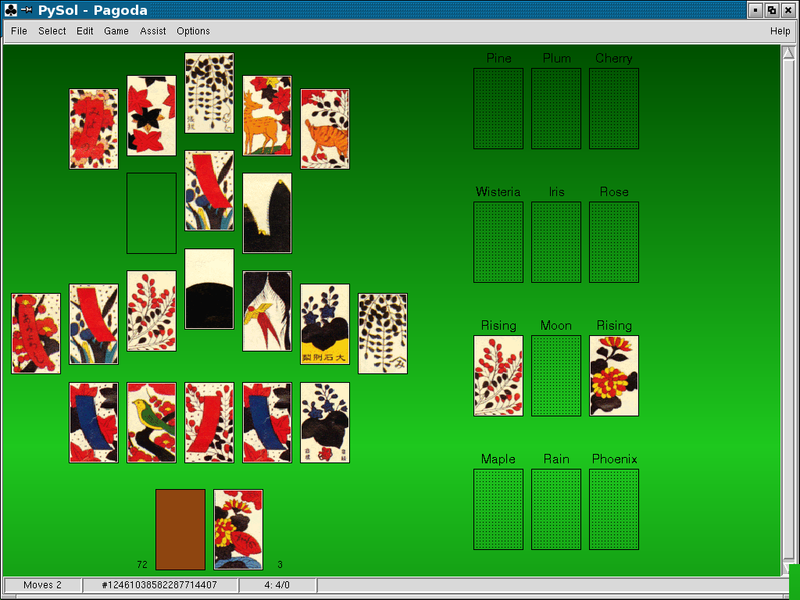 I particularly like this simple Hanafuda game, called 'Pagoda'. It's mindlessly simple, but I find it relaxing. People interested in a greater challenge might want to try 'Four Winds' or 'Onsoo'. 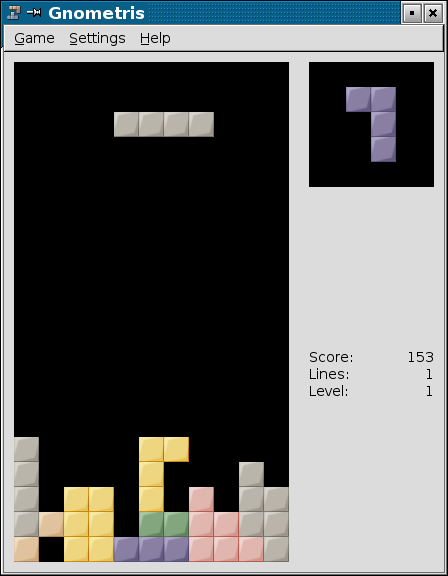 Gnome's take on a Tetris clone. 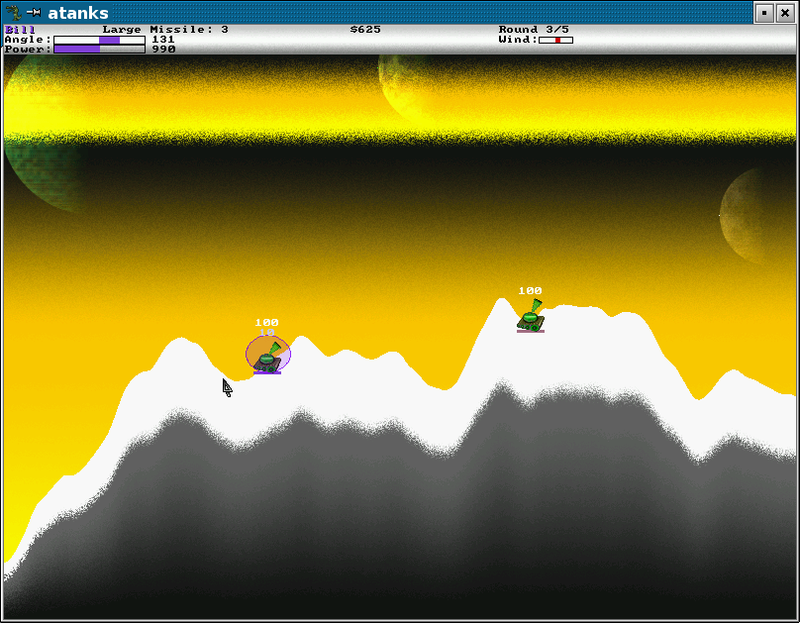 One of the smoothest playing versions, with nice graphics (which are not hard to customize). She couldn't rate them, of course, but my 3-yr old daughter, Ariel enjoys Planet Penguin Racer (formerly Tux Racer), Tux Paint, and the "Screen hacks" (also known as "screen savers", although it's been a long time since you actually needed these to save your screen from burn-in). 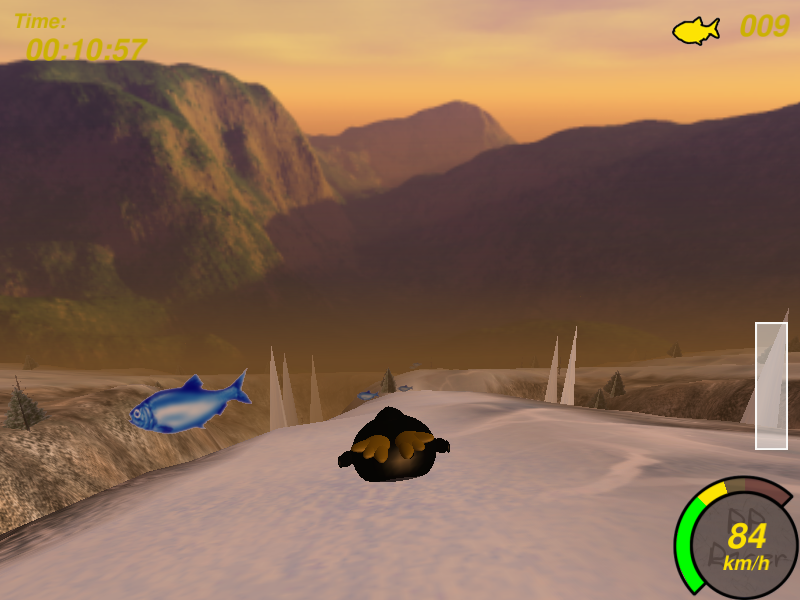 Planet Penguin Racer(formerly Tux Racer) is still one of the 'coolest' free software games. 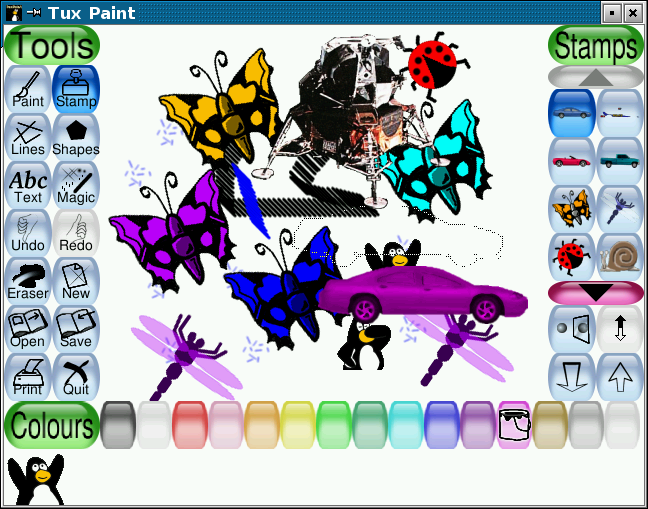 It's not strictly-speaking a game, but Tux Paint is a terrific creative play toy. It's a simple drawing program with a huge stamp library and sound-effects that play when you draw. *Flight of the Amazon Queen, a commercial SCUMMVM game donated to the digital commons by its developers, and now part of the Debian distribution. 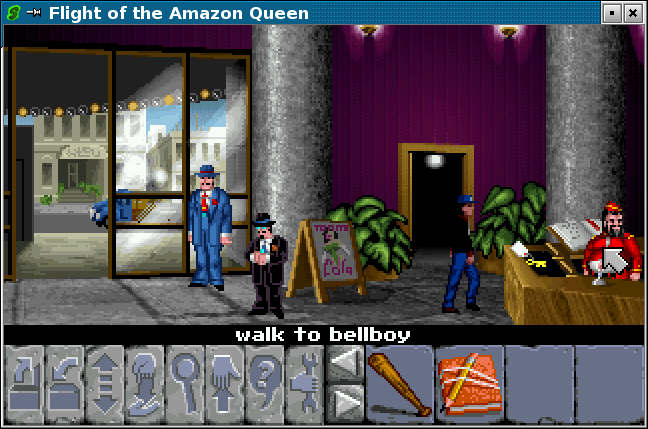 Flight of the Amazon Queen is a SCUMMVM graphic adventure game that was published some years back and recently released as free software. Interactive fiction, whether textual or graphical, has long been my favorite game genre, though I have less time for involved games than I used to (I haven't gotten very far in Amazon Queen, but it's fun so far). 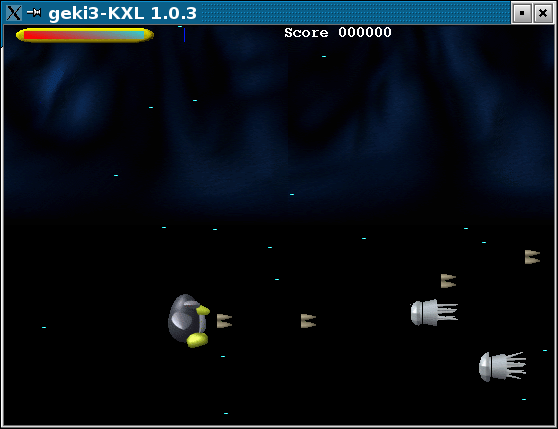 The "Mother of all Gravity Games" (MOAGG) is a pretty complete extension of what I used to play as "Thrust". Flying a ballistic vehicle through all kinds of obstacles—how could a space fan refuse? (Alan Berg and his son Nelson have already written a nicearticle about Wesnoth in FSM#11, which has some screenshots). What do you want to say about this game? "You can recruit teams and attack other teams", "You can edit how much gold you have, what kind of group, and you can 'level up'", "Realistic looking weird fantasy creatures" (whatever that means). What would you like to say to the developers? "Can you add music? ", "Why don't villages act like they have people in them?" Freecraft has a nice level editor. The only pity is that there's apparently no-way to save per-user game scenarios (I had to hack a common scenario location with wide-open permissions for the kids to use this—I'm not entirely sure if it works right). "Game where you select people and you know things they can do", "Pretty fun game in which you can control all sorts of units and make them go off and kill guys. You can't make Weapons of Mass Destruction like you can in Stratagus", "Some of the weirdest sound effects you've ever heard!" "Add user save levels in home directory" (currently, it doesn't appear that FreeCraft supports per-user configuration), "Add more sound tracks", "Add buildings that can attack by themselves, like missile silos", "Why can't you make new weapons?" 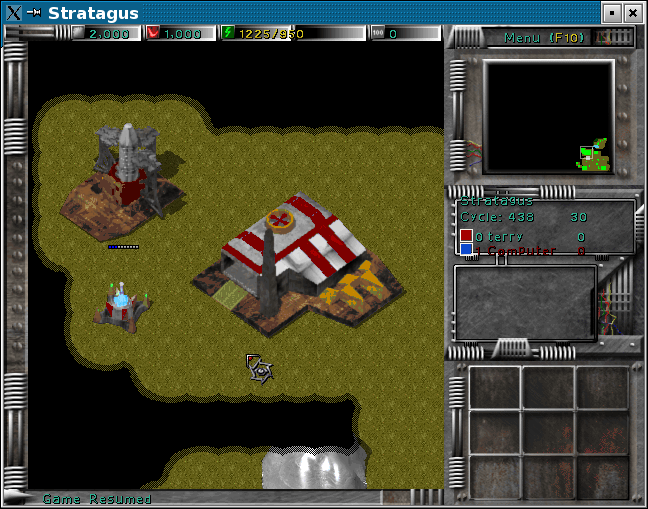 Stratagus is a high tech fork of Freecraft, with missile silos. Things blow up more. "Stratagus is like FreeCraft, only turned technological", "Stratagus is like what would happen if you took FreeCraft a few million years into the future, and got rid of all the fantasy stuff", "What in the world is a dorcoz?" (I don't know, either), "You can make guys". "Add user savable levels" (i.e. 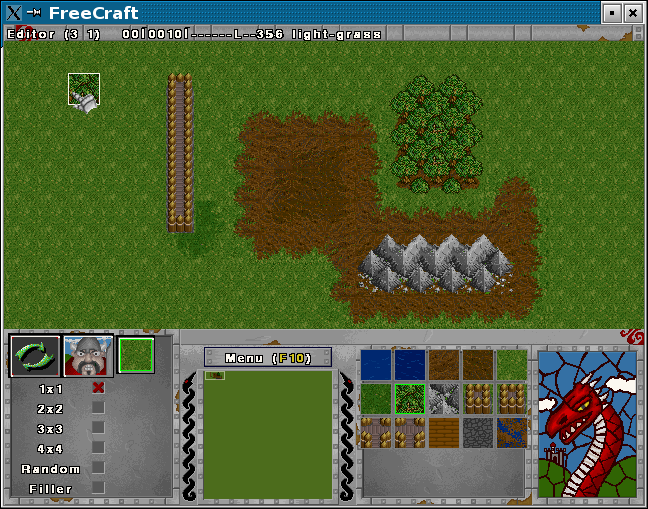 same problem as FreeCraft), "Add help on how to get units", "Add the ability to design new weapons"
Atomic tanks is a tank battle game with really high-powered ordnance, and fairly basic graphics. "Game where you have tank sprites and you choose weapons for them to shoot at other tanks", "can make new tanks, set difficulty levels, etc." "Is there a way to add weapons?" "Add higher tech levels and more options"
"Fun as long as you have a friend, but not fun as a single-player game", "Some options needed for any weapon to do anything", "Cows and gravity warps, dividing lines". "Add more weapons that are cooler, like 'tornadoes'. ", "Add natural disasters, e.g. 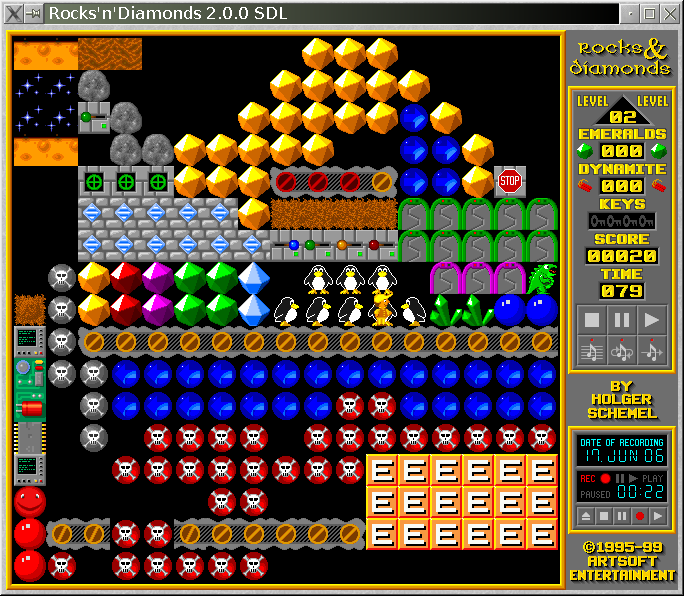 'Godzilla', 'Luozilla'"
One of Sylvan's levels in Rocks & Diamonds. I'm a little surprised to find his levels are already in the stable Debian distribution. I'm so proud! "Game where you usually have to get to the exit past enemies, and you either have to play the original levels or make your own"
"Add more kinds of blocks/tiles [to the level editor]"
Neverball is unusual in that your mouse controls the playing field, not the ball, so it's a bit like those hand-held games with BBs in them that you would tilt to make the ball go where you want. 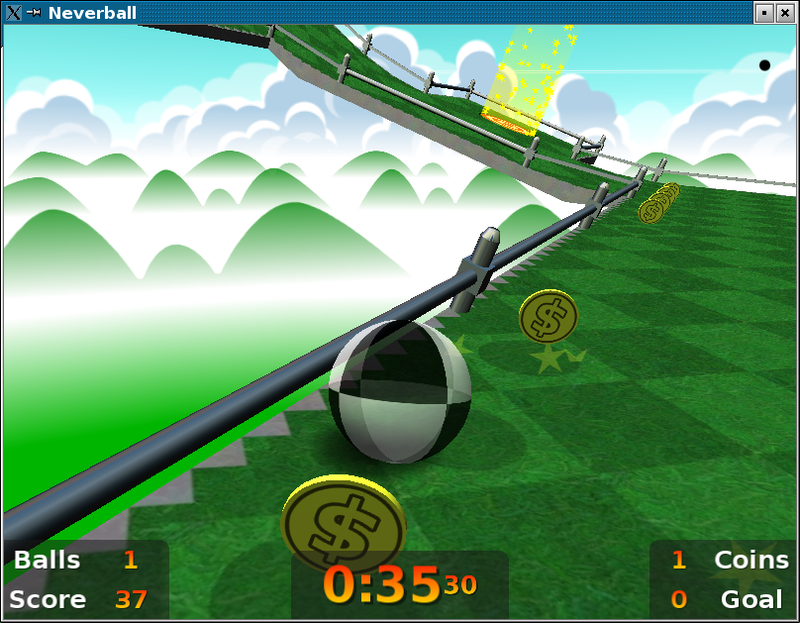 "It's a game where you have a ball, and you have to collect coins and get it to the exit", "Neverball is a fun game where you roll around a marble and you collect coins, jump over holes, and there are several different types of levels"
"Make it customizable? ", "Give it a tile-based editor to define new playing fields", "Use an elevation map like Tux Racer? ", "Why can't you have multi-player modes?" 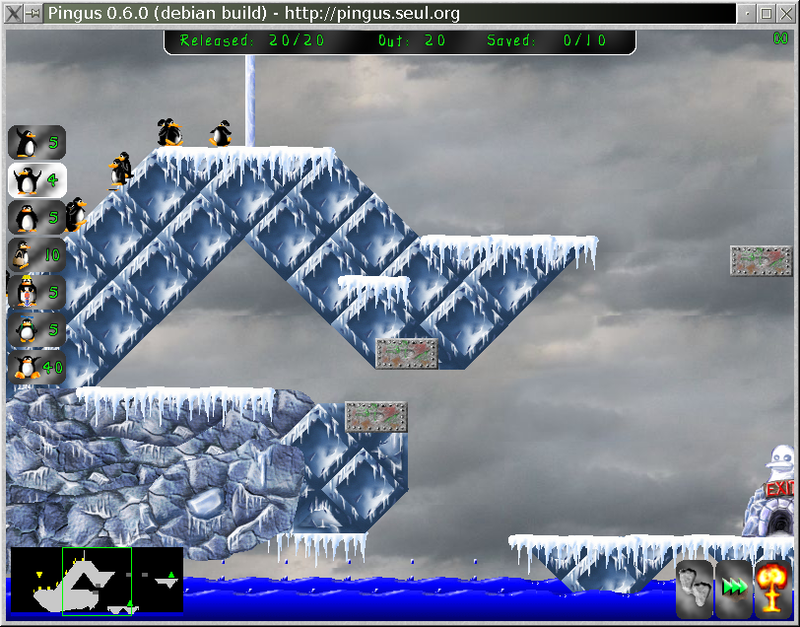 Pingus is a free version of 'Lemmings', but with extended playability. The level editor is nice, but it's hard to integrate the new levels into the basic game interface. "Pingus user-designed levels are too hard to get to after you've made them" (I think they'd like to see a generic level-browser in addition to the current structured play mode). 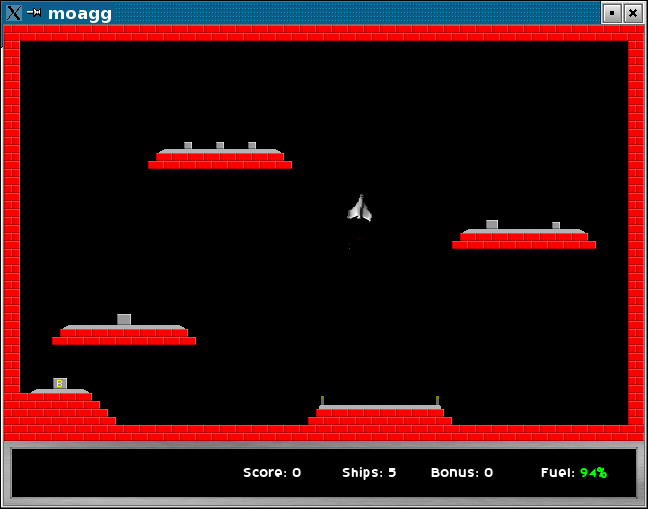 They'd also like to learn how to add graphic tiles to the Pingus level editor. We all agreed that there were also a whole lot of games we weren't giving due credit to. Both of the boys spent many hours playing Pingus, for example, about a year ago, but it's been displaced by Wesnoth and FreeCraft in recent months, so there's always some churn. I personally feel a bit embarrassed that I'm not into "more interesting" games—but I really do spend more time playing "Pagoda" (in PySol, a Hanafuda game) and the like. I suppose I just don't have the time for involved games. 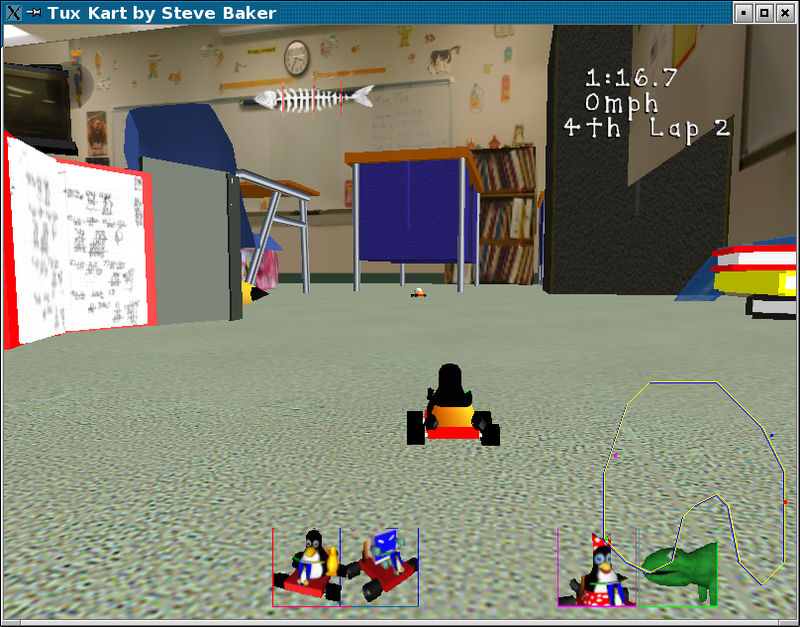 Tux Kart's 'Oliver's classroom' level is my favorite track. Nice OpenGL game, though for some reason the 3D rendering doesn't work as well on some video cards (lots of artifacts on ATI, for example). Another interesting fact is that my sons spend probably the same amount of time messing with level editors that they do playing games. I think that's an encouraging sign—it's the beginning of free software collaboration at a young age (in fact, Sylvan contributed 45 levels to the Rocks & Diamonds distribution about three years ago, when that was their current obsession). All in all, it's a fun play environment (though parents should exercise a little care: it's evident even from this list that free software games can be just as violent as their proprietary cousins. At least they're all just sprites—none of the games on this list is particularly graphic, but do vet games before letting your kids play them). All of these games are in the Debian GNU/Linux "main" archive, and are part of the current v3.1 "Sarge" stable release. On Debian, you don't need anything but "apt-get" to install them and you can use "apt-cache search *" to find these (and a couple hundred other) games. Other GNU/Linux distributions will likely have installation packages for most, or you can find the original source packages.